This week I spoke at my first ever Digital Tuesday at Tramshed Tech in Cardiff. These events are run monthly by Innovation Point and are free to attend. They have a loyal following and a really diverse audience which makes for great interaction and networking. This month’s topic was ‘The Innovation Generation’ focusing on how we in Wales create an environment where disruption thrives and innovation is encouraged and embraced. It’s a topic close to our hearts here at Perago-Wales. When we talk to people about what we do we talk about transforming through digital rather than digital transformation. It’s a subtle, but important difference. 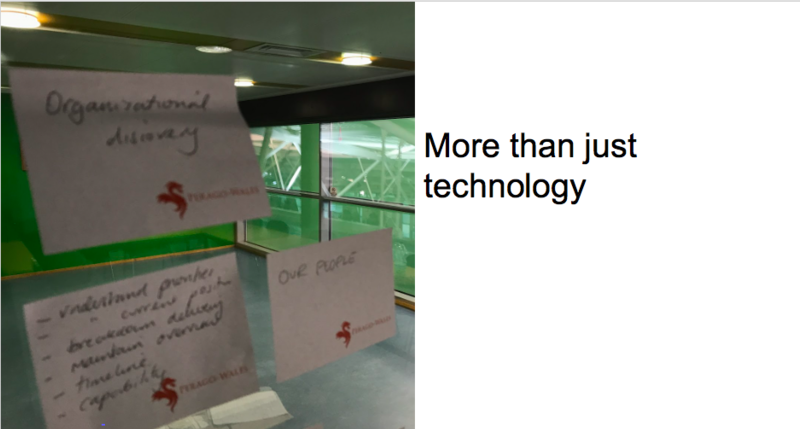 At Digital Tuesday I talked about digital transformation being about more than technology and creating an environment for digital talent to flourish, both in organisations now and for Wales in the future. Here’s a bit more on why digital transformation is about more than just technology. When people talk about digital transformation they often jump straight to a technology solution, building a website or implementing a technology platform. The opportunities to embrace technology are massive and we all have a responsibility to understand the opportunities, but technology is just the enabler, Transforming a service or an organisation is about much more. If you don’t understand who your users are and what or what they’re trying to do then how do you know if what you’re planning to do will work for the people you hope will use it? This is very different to understanding what you as a business might want and need. You need to understand both, but if you only focus on your business needs, chances are you will deliver something that doesn’t work for your users. It reminded me straight away of someone I used to work with who, in the right environment, with the right support, did brilliant things. We need to allow people to try things and learn from what goes wrong as much as from what goes right. Accepting ‘failure’ as part of the process for success can be a challenge for many organisations. Iterating and ‘failing fast’ is part of agile change methodology and, as described by my colleague Ross in his post Agile for teams who don’t build software, helps move us away from linear thinking where we map things out in our heads to get them right first time and allows us to try things, test them and change them to make them better and meet user needs. Good communication is critical for successful change delivery. You need to understand your audience and build effective two way communication channels that allow real time engagement and feedback. Internal communication is key to any transformation. From working in the open and blended change teams to creating conversations and visible leadership, make your internal comms team your best friend and the momentum for change will build. Transforming through digital is about the whole organisation, your people and your users. You need to step back, really focus on what you are trying to achieve and breakdown your business model to bring it all together into a roadmap for delivery. Then it’s about getting on and delivering.